I was asked if I'd like to review a copy of Waltzing With the Enemy : A Mother and Daughter Confront the Aftermath of the Holocaust and I said 'yes' because I really like learning about the history of World War II and I especially appreciate learning about it through the eyes of those who lived through it. 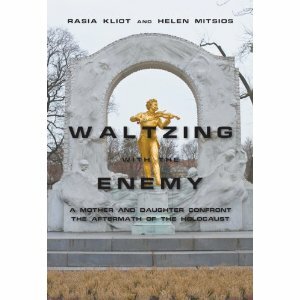 Waltzing With the Enemy is interesting in that it is a memoir of a mother and daughter duo. The mother, Rasia, was born in Vilnius, Lithuania and was of Jewish descent. The first half of the book tells the story of her growing up years prior to the war and then how she survived during the war - by hiding the fact that she was Jewish. The second half of the book is told through the eyes of Helen, Rasia's daughter. Helen was born after the war and was raised in Arizona by her mother, who continued (and continues) to hide her Jewish heritage, and by her father who was Catholic. I have to say that I enjoyed the first half of the book very much. Hearing about people who experienced great hardships and came out victorious is heart-inspiring. The anti-Semitism that Hitler promoted and enforced is utterly sickening. Hearing about people who survived it fills the soul with satisfaction. Good trumped evil despite its worst intentions. Rasia had to be quite creative in hiding her heritage and underwent some of the most trying life situations imaginable as she tried simply to stay alive. You can see from her story why she would be afraid to admit to people even now that she is a Jew because she lived in environments that made being a Jew frightening for so long. When you've once been forced to live in a state where you feel you must survive, it can be hard to move past that. When sharing who and what you are is dangerous, and 'owning up' to who you are could cause you and your family harm, it is hard to ever think you are safe. I cannot say that I enjoyed the second half of the book. Helen makes an argument that she has suffered as a result of the Holocaust as well in that she was never told of her Jewish heritage and was subtly taught to despise it as she was growing up. She speaks of being raised in a mixed religious household - her rather being Catholic and her mother just "going along with it" in order to hide her true identity. Helen did not care for her father and was very close to her mother. Discovering that her mother was Jewish was a huge revelation to Helen and seemed to turn her world upside down. Here is where I start to have a hard time with the book, reading from a Christian perspective. I do not deny that it is hard to find your identity and establish beliefs when your parents are inconsistent in their faith and practices. Anyone would be confused, as well as "lost" to varying degrees. I also do not deny that the children of Holocaust survivors suffered in ways that we will never quite understand. I liken this to children of parents who lived during The Great Depression. Their home life and way they approach finances are dictated by the adult generation's experience. I also liken it to children of people in the Military. We can never quite comprehend what they sacrifice in family life when their parent leaves for a long deployment. Certainly there are repercussions and we cannot and should not discount them. I suppose that it is the hopelessness that Helen seems to experience which gives me pause. She seems to be dazed and confused when it comes to figuring out who she is. Emotional turmoil seems to be her friend. And I do find that hard to comprehend. As an adult, Helen began to explore her Jewish heritage. She talks a lot about her timidity in doing so. She also shares of her struggles in relating to and without her mother, and how she had to receive counseling to discover how attached she was to her mother. Basically she comes across as an incredible insecure human being. I never know what to make of such personalities because insecure I am most definitely not. (I'm perhaps a little too over confident. Although I do have a habit of intentionally not offering my opinion sometimes which apparently always comes off as insecurity to the person I'm talking to which both amuses and frustrates me. How can I intentionally hold my tongue without appearing insecure and uncertain!? I have not figured this out yet.) I say all that to further explain that the second half of the book comes across as involving less history and, instead, more personal conflict issues. As such, I had a hard time really enjoying it. Helen's insecurity also made me question some aspects of Rasia's experiences and personality which have no doubt influenced Helen's approach to life. Anyway. I think Waltzing With the Enemy is an intriguing and fascinating concept for a book. Certainly the history aspect was compelling enough for me to make me read it all the way through. However, I don't think Helen's half of the book was particularly beneficial to the whole of the book. No doubt there are people out there who would heartily disagree with me and they are welcome to do so. It just didn't "work" for me in the way it was ultimately presented. So I'll give this book recommendation to you as a - take it or leave it. Thank you to Meryl Zegarek Public Relations, Inc. for sending me a copy of this book to read and think about. Some day you'll have to share your favorite WWII type books with me. I did a paper years ago that looked at the children of Holocaust survivors and the effect(s) of the parent's experience on the children. I don't think there's ever a good sense of resolution or closure for many of them. Just from your description I think I would feel much the same way. I can understand Rasia's actions -- I can't quite understand Helen's reactions. I can understand the shock it must be to find that your ethnicity is not what you'd always thought, especially in those times, and the shock of finding our your mother has been deceptive, but it seems she could understand why her mother acted as she did. Caniad - Helen did mention that in her portion of the book. It sounds as if she is definitely not alone in the area of closure. I saw your comment come in and hastily went to re-read what I had written about the book and I hope it's very clear that I'm not discounting the effects on the children at all. It was the insecurity that was expressed more on the part of Helen than her mother - who actually lived through the horror - that gives me pause. Anyway, I hope that's clear. This sort of reminds me of Bending Toward the Sun by Leslie Gilbert-Lurie, which I really liked. I can see how the second half of the book could be a little frustrating. I'm more interested in the history of the time and how it affected people than I am in the personal conflicts of the child of a Holocaust survivor. Not to say that her story isn't important, though. One of my favorite WWII survivor books (which your husband might enjoy too) is Andy Grove's book Swimming Across, available at the local library. Grove did seminal work in semiconductor physics and was CEO of Intel. I think I would react in a similar way. The struggles you had with the second half of the book must be underscored by the contrast with the first half. Maybe it helps to think of them as accounts from different points in the story. Give Helen Mitsios ten years and she'll have more worked out. As a person who reviews books, just because you yourself don't feel any insecurity and boast about it, it's ego-centric and shallow to say a child of Holocaust survivors doesn't struggle with a lot of issues. One of them is holding their parent up as a hero and never feeling quite as brave or as strong as they are - hence the insecurity. Your comments are thoughtless. See the excellent review of this book in The Brooklyn Rail.